First things first. Before I crank the album on, I do my homework. Research the bands' origin, ensure my facts are straight. RIBSPREADER. Everywhere you go for info the band is introduced as being “a band Dan Swano was in.” Yeah, in 2004. We all have our resumes and some moments shine more than others, however how long can ya milk it? This is the 8th release for RIBSPREADER. If ya can’t make it on your own name at this point. In closing, on this topic, it’s like Dave Mustaine carrying on about METALLICA. Don’t throw a name around to get yours mentioned. Moving on. “The Van Murders Pt. 2” Yet another blast from the past but re-visited, as the band released “The Van Murders” back in 2011. A concept album with actual characters. “The Cleaner” and “Mr. Filth.” First, this is a very cool idea. To kind of bring about a modern day urban legend. There is a generation of us who see a white Dodge Econoline van and walk the other direction. Years of imprinting about stranger danger and abductions occurring by a man snatching you up and driving off in a mysterious white van. For the kids, it’s creating a physical monster with neighbor like attributes and for the parents it’s their worst nightmare, thinking of what that psycho could be doing to their minor child. The whole concept is pretty brutal and disturbing. And honestly not much has changed. “Back on the Frostbitten Shore” is every song from every band that just spits out monotony. It’s a damn shame too. 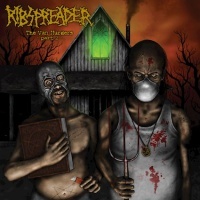 RIBSPREADER has the sound, has the vocal tone, but kind of like a movie sequel, the hype is there, the potential is there, but when you walk out after seeing it all you can say is, “Well, it wasn’t bad.” There are some bands that recreate that 90’s death metal vibe but have something current to contribute. This track had the standard high-speed entrance and the predictable “yaaaaaaaa” scream. Waiting for the song to get to the verse, despite not really being that long, felt like forever. After the verse, there is a slower break down and attempt at a melodic line but is nothing more than 3 notes drawn out too long. Growl, growl, growl, then scream back to the main riff with an artificial harmonic signaling the repeat. “Come out and Play Dead,” is this the same song I just heard? Seriously. I found myself kinda of drifting away from the music and imagining my sink full of dishes. I’m not bashing RIBSPREADER by any means. I seem to be yet another opinionated voice that thinks all the right elements are there, however it’s just falling short. Don’t replicate, innovate. This is merely self-plagiarism. Waiting years and years for that mind-blowing album from these guys knowing that this is their 8th and if it hasn’t happened by now, it likely never will. For those who loved 1 album of RIBSPREADER and wanted more of the exact same, then this is totally for you. The album played well on PC speakers, but I didn’t even bother with the car for fear I may zone out while driving. “The Van Murder Pt. 2” is due out June 6th of 2018 via Xtreemmusic.